Shed no racket tears for these abandoned tennis courts as there’s no bawls in tennis… OK, that’s out of line but these courts ARE out of service. 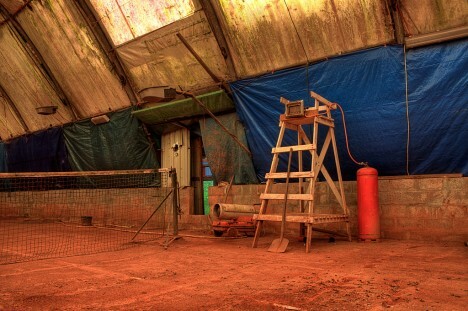 Looking like a set from The Walking Dead, this precariously covered tennis club in Europe’s Benelux region appears to have been abandoned twice – once by tennis players, then by the artist who owns (or owned) the place. The former club must have been more than just a private backyard court – at least one line judge’s chair can be seen, shunted off to the side. 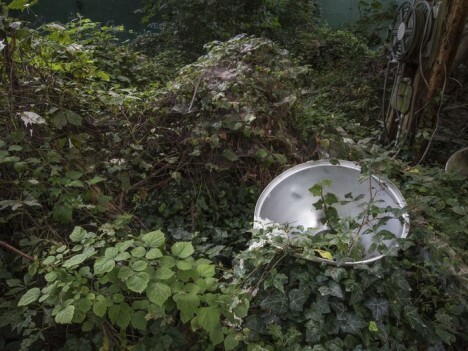 Odd that the artist adaptively reusing the club as a studio would save such a specialized piece of furniture. 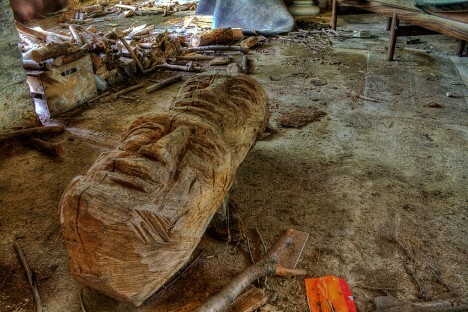 Kudos to Flickr user Tunebm, who somehow was able to access the abandoned court in early July of 2010. Flickr user John Haslam (foxypar4) titles the above November 2008-dated photo “Malta in audacious bid to stage ATP Masters Series Final!,” and you can bet that’s an event anyone would gladly pay to see. 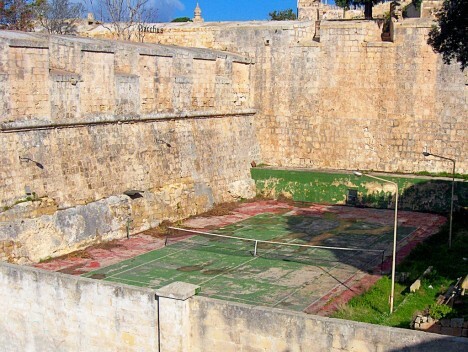 Set into the long-dry moat surrounding the ancient fortified city of Mdina, the court has at least one thing going for it: chances of a successful Ottoman invasion are very unlikely. Blue-blooded businessman and banker William du Pont, Jr (1896-1965) was quite the sportsman in his day. 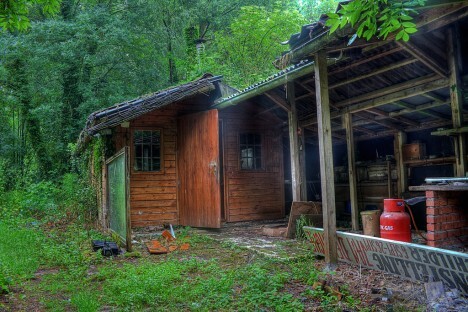 In the depths of the Great Depression, he had a grandiose recreation center housing basketball and badminton courts, a bowling alley, a swimming pool and a large clay tennis court built at his Bellevue Hall, Delaware estate. 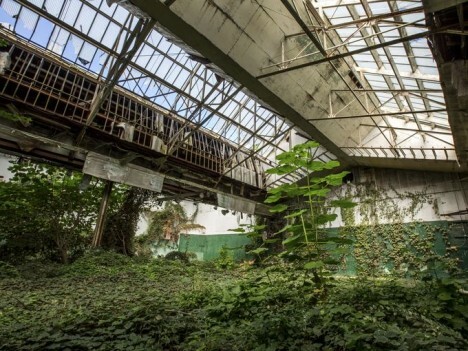 By the early 1970’s, none of du Pont’s heirs had any interest in the estate’s deteriorating sports facilities nor the expense required for their upkeep. 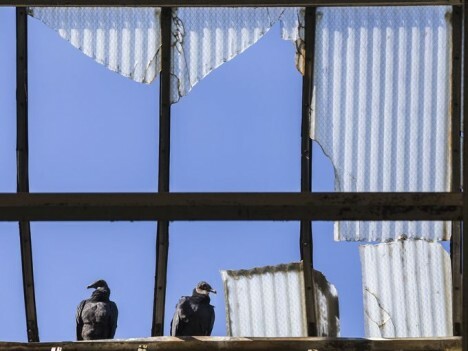 The property was purchased by the state of Delaware in 1976, opened to the public under the name of Bellevue State Park… and continued its inexorable decay. 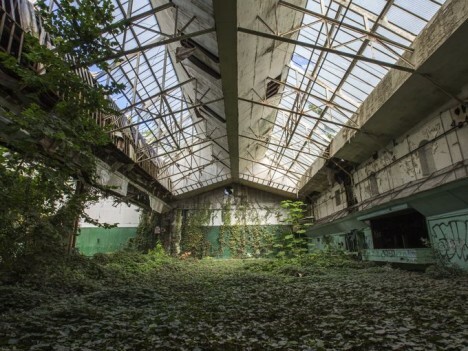 By 2014 when the above images were taken by Kyle Grantham for The News Journal , the sky-lit tennis court was overgrown with vegetation, infested with wildlife, and had been slated for demolition. 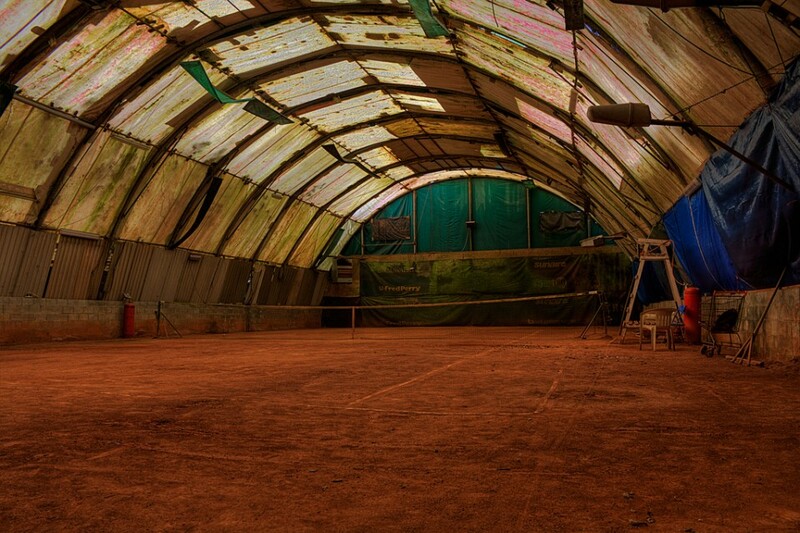 This gorgeous abandoned tennis court in Herzliya, Israel would appear to have everything but regular maintenance and the odd player or two. 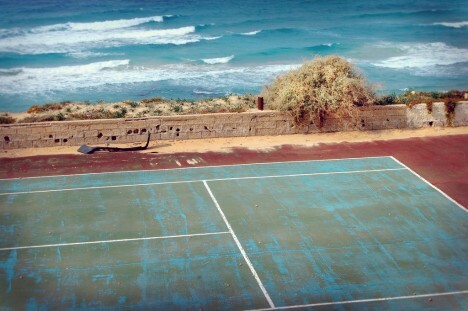 According to Flickr user Elinor Zach (who snapped the seaside scene on January 2nd of 2008), “This tennis court used to belong to a hotel that was super posh in the 80s. I wish I could see the characters that used to bounce their little green balls there.” That’s what SHE said. 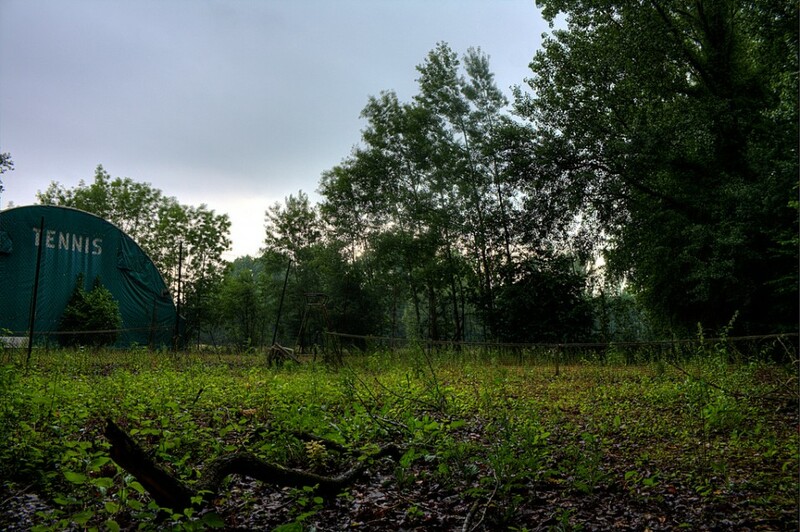 Flickr user Franck VIALA (Artretros) got down & funky – or should we say, fuzzy – back in September of 2011 when he snapped this shot of an abandoned French tennis court. 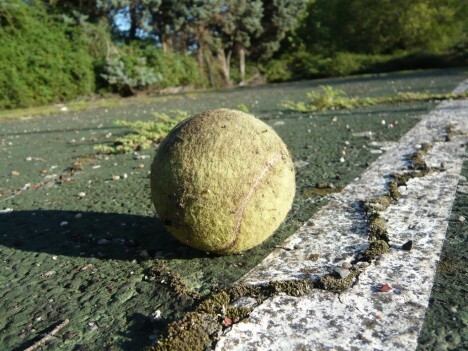 “An abandoned tennis court where I used to play since I was 10 maybe,” states the photographer, possibly with the pictured tennis ball.